Park to Park Pedal – Extreme Nevada 100 is a feast for your eyes! Take in the view as you pedal through some of the most diverse landscapes, towns, and state parks in Nevada. The ride starts and finishes at beautiful Kershaw-Ryan State Park situated in colorful and scenic Rainbow Canyon. The registration fee of $55 includes a T-shirt, Food/Snack & Beverage at Rest Stops, Technical Support at the Start – Finish as well as on the course, SAG Support, and a Dutch Oven dinner after the ride. 103 mile Extreme: Starting at Kershaw-Ryan State Park, this century ride takes peddlers through the towns of Caliente and Pioche, and through three other state parks: Cathedral Gorge, Echo Canyon, and Park to Park Pedal photoSpring Valley and back to Kershaw-Ryan State Park. 38 mile Double Helix: Not ready for the century but want to experience the beauty and adventure Lincoln County has to offer? Don’t get wrapped around the axle! Do the two park loop. Go from Kershaw-Ryan to Cathedral Gorge State Park and back again. Family Fun Ride: Enjoy the changing colors and scenery as you pedal on the pavement through Kershaw-Ryan State Park. This ride is perfect for children and anyone who just wants to get out and enjoy the day. This ride is free. You may buy a t-shirt or dinner ticket separately. Call for more details 775.728.4460. 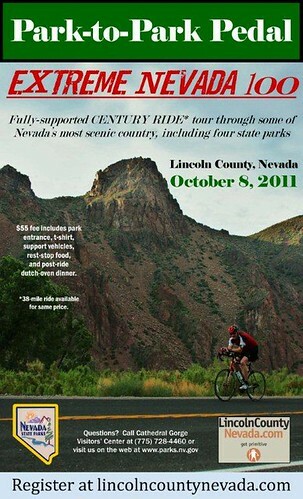 Pre-registered Rider Check-In takes place Friday night, October 7, 2011, from 5:30 p.m. until 7:00 p.m. at Kershaw-Ryan State Park on Hwy 317 in Caliente, Nevada. Camping is available at Kershaw-Ryan and other area parks. Motels are available in Caliente. Same Day Registration is the morning of the ride, Saturday, October 8th at Kershaw-Ryan State Park from 6:30 a.m. to 7:30 a.m.
• 103 mile Extreme: 7:30 a.m.—8:00 a.m.
• 38 mile Double Helix: 8:00 a.m.—8:30 a.m.
• Family Fun Ride: 9:30 a.m.—10:00 a.m.
Park to Park Pedal – Extreme Nevada 100 is a fully supported bicycle tour that includes Rest Stops with food/snack & beverage on course, Technical Support on course and SAG Support should one require vehicle transport back to the finish.